292 pages | 87 B/W Illus. The 2008 financial crisis, the rise of Trumpism and the other populist movements which have followed in their wake have grown out of the frustrations of those hurt by the economic policies advocated by conventional economists for generations. Despite this, textbooks continue to praise conventional policies such as deregulation and hyperglobalization. This textbook demonstrates how misleading it can be to apply oversimplified models of perfect competition to the real world. The math works well on college blackboards but not so well on the Main Streets of America. This volume explores the realities of oligopolies, the real impact of the minimum wage, the double-edged sword of free trade, and other ways in which powerful institutions cause distortions in the mainstream models. Bringing together the work of key scholars, such as Kahneman, Minsky, and Schumpeter, this book demonstrates how we should take into account the inefficiencies that arise due to asymmetric information, mental biases, unequal distribution of wealth and power, and the manipulation of demand. This textbook offers students a valuable introductory text with insights into the workings of real markets not just imaginary ones formulated by blackboard economists. A must-have for students studying the principles of economics as well as micro- and macroeconomics, this textbook redresses the existing imbalance in economic teaching. Instead of clinging to an ideology that only enriched the 1%, Komlos sketches the outline of a capitalism with a human face, an economy in which people live contented lives with dignity instead of focusing on GNP. "a wonderful book… a manifesto… written in a style that is easy to follow… highly innovative and a must-read, especially but not only for students who are new to economics… John Komlos has given us a valuable tool that we can use to enrich our teaching and open the minds of our students… We owe him our thanks. More, we owe him our students’ patronage." Gerald Friedman, Professor of Economics, University of Massachusetts, Amherst. 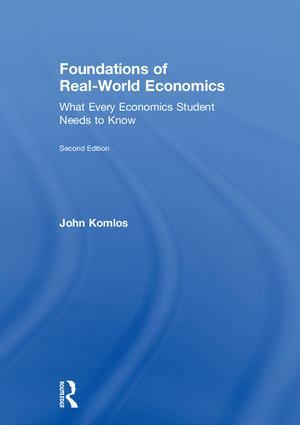 "John Komlos has given us a very useful companion text to the standard introductory economics version. Students would do well to read the two together. In fact, anyone who has taken introductory economics and had it shape their thinking about the world would benefit from learning about the issues raised in this book." Dean Baker, Senior Economist, Center for Economic and Policy Research. "The real world seldom operates like the diagrams in economics textbooks. Often left out are that human beings often act irrationally, markets have rules, and models typically began with the assumption of ‘… all else being equal’ John Komlos provides a welcome and much needed real world look at the dismal science in his Critique of Pure Economics. In plain language that even high school seniors can grasp, Komlos shows the wishful thinking that infects standard economic texts and builds his case with empirical facts." David Cay Johnston, Pulitzer Prize-winning author of The Fine Print: How Big Companies Use "Plain English" to Rob You Blind and the New York Times bestseller, Perfectly Legal. "Komlos’s provocative book at once brings together and creatively synthesizes a great deal of work critical of conventional economics and lays out the broad contours of an alternative approach that the author calls humanistic economics… Komlos’s book is timely and relevant. The author includes excellent discussions of income and wealth inequality, the cultural contradictions of capitalism, and green environmental accounting, as well as an entire chapter on the financial sector (a sector often omitted entirely in introductory classes) and the sector’s role in the Great Recession." Peter Coclanis, Director of the Global Research Institute at the University of North Carolina at Chapel Hill. John Komlos is Professor Emeritus of Economics and of Economic History at the University of Munich, Germany. He has also taught at universities such as Harvard, Duke, UNC-Chapel Hill, University of Vienna, and Vienna School of Economics and Business. In 2003 Komlos founded the field of Economics & Human Biology with the journal of the same name, and through his research he has come to realize the limitations of conventional economic theory and has been an ardent advocate of humanistic economics.